Got a hankering for baked beans. Sure, it’s cute watching Jay Bush and his golden retriever Duke, who seems to be on a mission to sell the secret recipe, like any capitalist dog would be. Makes you want some beans. Or a golden retriever. Makes me want neither. Bush’s Beans are probably a perfectly fine product, but I’ve always been a B&M kind of guy, and I’m not particularly fond of dogs, although I’ve grown to love my wild and crazy German shorthaired pointers, Argos and Maggie (Argos, I should point out, has no interest in selling any of my recipes; he has a one-track agenda, which is to eat everything I cook. Maggie, on the other hand, would sell my recipes in a heartbeat if she thought she could turn a profit; she’s probably the most dedicated capitalist in the family). But I digress (I hate when I do that). I was reading someplace recently that some kid’s favorite food was baked-bean sandwiches–homemade baked beans on fresh homemade bread–and I got to thinking about that. Could that be nature’s perfect food? The writer was recounting how such sandwiches ignited his love of all things food and how they inspired him to become a chef. It started, he says, because he couldn’t find a pile of baked beans anywhere near as good as the scratch batches his grandmother made for him. I can relate. I was raised on the cooking of a wonderful woman who came from the Piedmont of Virginia, where home-grown pork and chickens and corn and cabbages and greens were on the table every day. She made her baked beans (and everything else) from scratch, and the tale of baked-bean sandwiches massaged a longing in me I hadn’t felt in quite a while. Consequently, I got a hankering for baked beans. Lily Jones was not available to make me beans, and I’ve never really worked up a recipe of my own. So I decided to do some research, find a recipe to start with, and then make it my own. Something hearty, flavorful, bold, and memorable. I must have read 500 recipes. What I kept coming back to was a fabulous website chock full of recipes that use beer as the principal ingredient. Beer! That’s the ticket! But not just any beer. It needed to be thick, dark, malty, nutty–hair-raising. I found a recipe that resonated, and then kept reading, comparing each next one I found to the one that sang to me, and not one measured up. And then, I made the beans. Incredible. Salved my hankering, my wife, the remarkable Ellen, followed up with a honey-Hefeweisen boule made with a locally brewed winter wheat beer, and voila! Baked-bean sandwiches for the Gods. Next, I had to make the recipe my own. The recipe on the website is perfect as is. But it’s not mine, alas, and I thought I could improve it. Guess what: I couldn’t. It’s perfect as is. The only thing I did change was to use turkey bacon (we don’t eat much pork around here) cooked in two teaspoons of extra-virgin olive oil; and instead of a smoky porter I used Sierra Nevada Coffee Stout. Try this if you want perfect beans. And if you want a perfect bean sandwich, make the bread, too. It’s almost as simple to make as the beans–no kneading, just rest and love. Place the beans in a large pot with 3 cups of water. Cover and bring the pot to a boil, and cook for 3 minutes. Remove from the heat and soak for 8-12 hours; overnight is good. Rinse with cold water and drain. Cook the bacon in a skillet over medium high heat, remove bacon from pan. Add the onions to the bacon grease, cook until soft, about 5 minutes. Chop the bacon. Add the bacon, onions, drained beans and remaining ingredients to a slow cooker. Cook for 8 hours on low, stirring once or twice during cooking. If beans are still firm after 8-10 hours, turn to high and cook for an additional 2 hours. 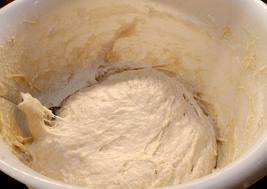 In the bowl of a stand mixer fitted with a dough hook add the flour and yeast, mix to combine. Heat the beer to between 120 and 130F degrees. Add the beer and the honey to the flour, beat on high until dough gathers around the hook and is no longer sticky, about 6 minutes. Transfer the dough to a lightly oiled bowl, cover and allow to rise in a warm place until doubled in size, about 1 hour. Place a baking stone in the oven, preheat for 30 minutes prior to baking. Once the dough has risen, place a bread peel (or a sheet of parchment paper) on a flat surface, cover in cornmeal or semolina flour. Grab the dough in your heads, folding it into itself gently a few times, then form into a tight ball. Place on the peel (or parchment paper), allowing to rise for about 30 minutes. Brush the top with egg wash, slash an “X” on top of the loaf using a sharp knife. Transfer the dough to the pizza stone using either the peel or by simply placing the parchment paper on top of the heated stone (if you don’t own a bread stone, just place the parchment on top of a baking sheet and set that into the oven when you are ready to bake). Bake at 400 until top is a dark golden brown and makes a hollow “thump” sound when tapped, about 30 minutes. *This recipe is for a very low IBU (low hop) beer. If all you have is a pale ale, IPA or hoppy wheat, use 3/4 cup beer and 3/4 cup hot water or the beer taste will be overpowering. And to Jackie Dodd, “The Beeroness,” I offer a toast: Jackie (wwwthebeeroness.com), you’ve won my heart. Or more accurately, my appetite. I had a request that I just couldn’t refuse. I lived in San Francisco–actually, Mill Valley in Marin County–across the Golden Gate Bridge to work every day…WOW!–and more than virtually anything else, I fell in love with sourdough bread. On Sundays we would ride our bikes from Mill Valley through Marin City to Sausalito, then ride the ferry to Fisherman’s Wharf and eat crab legs and sourdough bread. I think that was one of the seminal times in my life in terms of cementing my love for food. The really cool thing about that experience was that walking up and down the docks, one could sample the bread from different bakers the way we walk up and down the aisles at Roots and take little tastes here and there from vendors who truly love what they do and the product they represent, which really represents them. We all have favorite vendors at Roots and Central Market and Eastern Market and Millersville Farm Market, and all the others (not forgetting you, Alison Bryan!). The one thing they all have in common is that they try to stay true to their product, because their success and their reputation depends on quality product courteously presented. I’ve found that the vendors at these markets are fine representatives of our wonderful Lancaster way of life. And I appreciate it all the more because of my time in San Francisco, where the bread is the memory I carry with me every time I think about that time in my life. 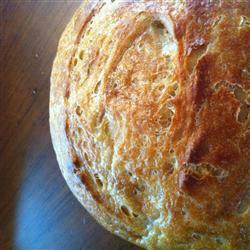 Here, then is my favorite take on San Francisco sourdough bread. The thing that makes it what it is is that first, you make a starter. This starter is a piece of sour dough that gets added to the bread dough during the process, and then a piece of the new bread dough is separated and stored, to be used in the next loaf. In San Francisco, starters are generations old, always added to the new bread, then kept again for next time, thus keeping the original starter alive. Over time, it gets better and better, and divorces have been known to have the cup of starter be the single bone of custodial contention. Make a starter. Make a bread. Keep your starter. Make some more bread. Share the secret. Share the love. And don’t forget the butter! In large non-metallic bowl, mix together dry yeast, 2 cups warm water, and 2 cups all purpose flour and cover loosely. Leave in a warm place to ferment, 4 to 8 days. Depending on temperature and humidity of kitchen, times may vary. Place on cookie sheet in case of overflow. Check on occasionally. When mixture is bubbly and has a pleasant sour smell, it is ready to use. If mixture has a pink, orange, or any other strange color tinge to it, THROW IT OUT! and start over. Keep it in the refrigerator, covered until ready to bake. When you use starter to bake, always replace with equal amounts of a flour and water mixture with a pinch of sugar. So, if you remove 1 cup starter, replace with 1 cup water and 1 cup flour. Mix well and leave out on the counter until bubbly again, then refrigerate. If a clear to light brown liquid has accumulated on top, don’t worry, this is an alcohol base liquid that occurs with fermentation. Just stir this back into the starter, the alcohol bakes off and that wonderful sourdough flavor remains! 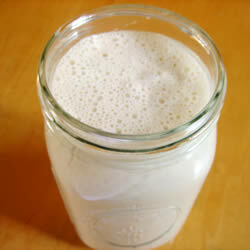 Sourdough starters improve with age, they used to be passed down generation to generation! In a large bowl, combine 1 cup flour, sugar, salt, and dry yeast. Add milk and softened butter or margarine. Stir in starter. Mix in up to 3 3/4 cups flour gradually, you may need more depending on your climate. 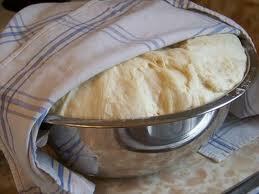 Turn dough out onto a floured surface, and knead for 8 to 10 minutes. Place in a greased bowl, turn once to oil surface, and cover. Allow to rise for 1 hour, or until doubled in volume. Punch down, and let rest 15 minutes. Shape into loaves. Place on a greased baking pan. Allow to rise for 1 hour, or until doubled. Brush egg wash over tops of loaves, and sprinkle with chopped onion. Bake at 375 degrees F (190 degrees C) for 30 minutes, or till done. Then refresh your starter by following direction number 4 above, using 1.5 cups water and all-purpose flour and a pinch of sugar.